Denka Advantech has been facing several problems with the water quality in their cooling systems. en a lot of brown water found in the sump of the cooling towers. The customer tried to rinse these with clean water to flush out rust particles. Treating the water with chemicals is not possible, as the pipes are a mixed installation made from copper and (stainless) steel. Therefore every kind of chemical treatment would harm the surfaces. 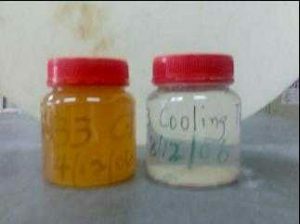 Water samples were taken at the return line of the cooling loop right before entering the cooling tower. The picture shows that the water in the first bottle is rusty brown. It was assumed from the customer, the color of the water is coming from corrosion. To control the corrosion in the cooling water, Merus Rings were installed at the return line to the cooling loop. After one week a second water sample was taken and the result is clearly visible. The water in the bottle on the right does only contain a few particles and is almost clear. This indicates the brown color of the water was of biological origin. So it was possible to clean the water in just one week. As the effect on microorganism can be seen faster. When treating a system against corrosion it might take a few month until the water is clean. This kind of visual monitoring is an easy and cheap way to check the performance of the water treatment in your system. We often use it at our Merus installations as it is impressive for the customer and saves lab expenses. Denka, the customer, operates a second cooling loop. Consisting of one cooling tower to cool down the furnances producing silicate powder. 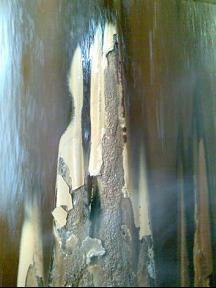 Due to the very high temperatures this cooling tower is infested by limescale. Even though the water is chemically treated. To cool the outside of the ovens water is sprayed on the walls. Due to very high temperatures a nasty crust of limescale was formed on the walls. See as well the pictures. To clean this away was always a big challenge for the service people. A job which required a shut down of the process and almost a whole day hard labour. We installed a second Merus Ring in this cooling loop to solve this problem. The outer wall of the furnace was checked constantly to observe the development. Suddenly dry parts of limescale fell off the wall without manual cleaning or other support. On the surfaces the first traces of magnetite formed. 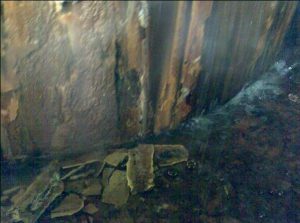 In addition to the scaling problem at the furnace, there was found a high bacteria count in the cooling water. The bacteria count in cooling towers is limited and controlled by the authorites. This limit is 10.000 cfu/ml as in Europe. The customer observed through the inspection glass in the piping, that algae and biofilm became brown and started dying. Additionally the amount of bacteria in the water was reduced from 9400 cfu/ml to 100 cfu/ml.